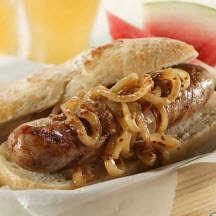 CooksRecipes has quality, kitchen-tested recipes for a variety of bratwurst, frankfurter and sausage heroes, grinders and sandwiches. These hearty and simple sandwiches are a street fair favorite can be enjoyed at home. 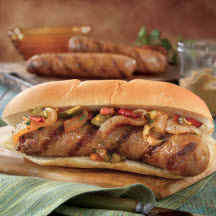 Bratwursts get dressed up with this sweet onion relish. The onion relish can be made ahead of time and reheated when ready to serve. 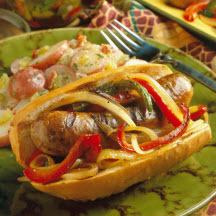 Serve with a variety of mustards, soft hoagie rolls to hold the brats and onion marmalade, German potato salad and pickled vegetables.